The screenshot here shows that the wobble that used to be so prevalent in RA is now all but gone and the remaining movement in DEC is minor. The remaining movement in DEC is so small that it's under the 1 pixel threshold for each image. Yes, over the whole session there is some movement and that could cause some blurring. In a perfect system, there would be no movement from the dictated guide commands. To give an idea of the expected precision of the guiding, look at the scatter graph in the below screenshot. The guide graph shows that most of the errors are in RA to correct periodic error and the DEC error is to correct for drift. Almost all the errors are within the 2 arcsecond window. The imaging scale for the DSLR is 1.9 arcseconds/pixel and the guiding image scale is 3.2 arcseconds/pixel. 1. Added aluminum shim strips to the SV4 rings. Because of the way the flexure platesolve results gave information in the past, I believed that the movement was happening mostly within the SV4/DSLR. Platesolves were showing that the differences between the two solved images grew - and that the SSAG was not moving from its orientation. Thus, just the DSLR was moving. When I looked at the rings for the SV4, I noted that they closed down tightly - the jaws of the rings touched each other. This suggested that there was no way for the rings to grab the scope tube any tighter. Thus, I shimmed the rings a bit more to increase their ability to hold the tube. I added 3 layers of thin aluminum stock (cut from a ventilation fan tube) and now the ring jaws do not clamp tightly on themselves. Instead, they hold the SV4 very tightly. 2. The DSLR continues to be mounted on the tripod socket which rides on a plate on a dovetail bar. This system is even more critical now that I have taken the focuser apart a few times. I have made an effort to line up the dovetail bar and the clamping plate to ensure that when I tighten it, that the body of the camera is not skewed relative to the SV4. Luckily, the focuser tube and flattener are a snug fit and if these slide easily into place, then the camera is lined up properly. Simply tightening the camera plate on the dovetail will show any off-axis movement and I can watch carefully for issues. 3. The Feathertouch focuser on the SV4 needed tightening. This focuser is held in place with grub screws that have a sharp point so that they bite into the flange metal. However, these bite marks have left indents in the wrong place. I have taken care to move the system a few degrees so that there was new metal to engage. I also made sure that the focuser body remained flat on the adapter plate. 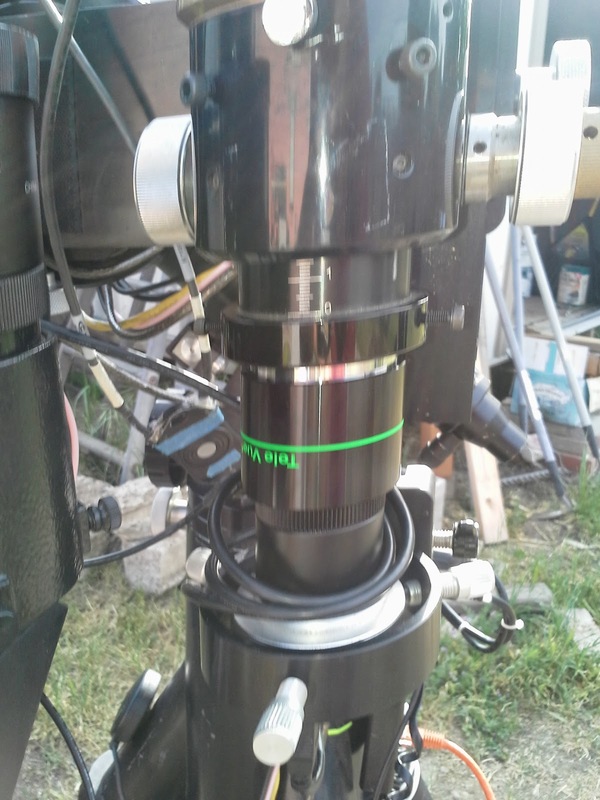 In order to keep this flat, I removed the scope from the rings and set it on end so that I could watch for light between the adapter and focuser. So long as I didn't see light, I knew they were flat. CCDI results show that the field flatness remains good after this work. 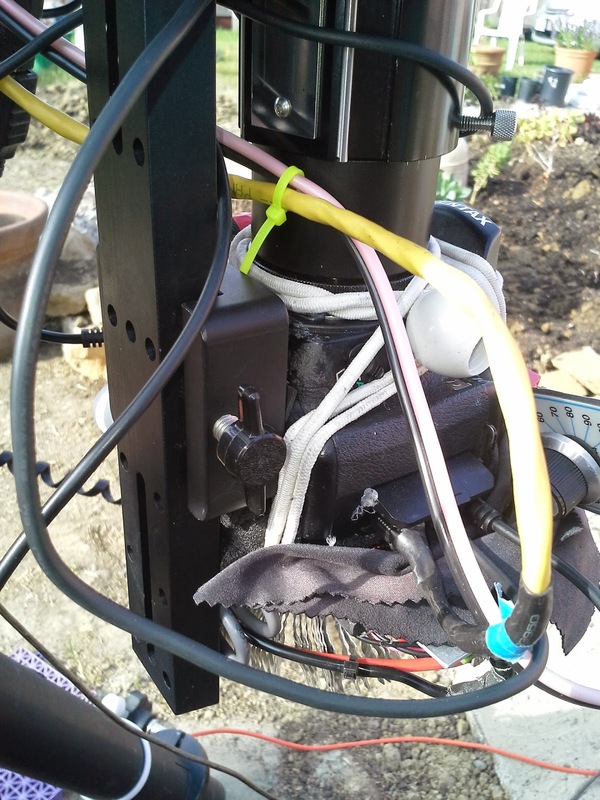 Another thing I noticed was that the locking screw does not fasten down tight enough to secure the tube under the weight of the whole system. I think that may mean there's a need to replace a roller or friction pad? I also noted that when the locking screw is loose and the camera is tight, racking the focus back and forth will tilt the camera. Very interesting and it suggests that gradual tilt may be introduced to the system when the SV4 experiences fast temperature shifts. In fthe future, going to an ASCOM controlled focuser will resolve that tilt problem, but would require that the camera doesn't create tilt from its own weight. 4. The SSAG is fully locked down on the SV70ED. Described earlier, the focuser on the SV70ED has a number of places where it can be made stiffer. 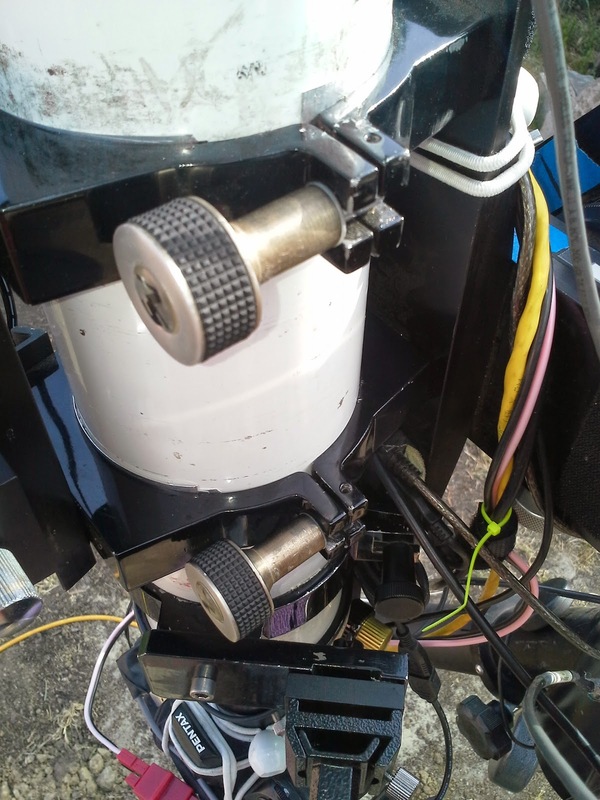 I had not done any of these adjustments in the past and was dependent on supporting rings for ensuring the guidecamera (SSAG) didn't move. Now that I have replaced grub screws with socket head screws that are long enough to lock down the parts, the drawtube no longer moves so readily. I may be able to remove the rings once I shim the main scope body to point to the same part of the sky as the SV4. These above efforts are all part of making the optical supports as stiff as possible. Now that I've made the changes, I am curious how much each one matters. I believe that the modifications to the guide scope are not as critical as the changes to the SV4 rings and focuser. I am hoping that in the future, I'll be able to remove the guide scope and use the Orion mini guider to repurpose the SV70ED as another imaging device for widefield. Further testing on the mini guider will be done. The question becomes if I wish to upgrade the guidecamera at the same time to the newer QHY5II-L.